Job Name: Give a distinctive name to your job. Thread Count: Number of threads executing the migration. Be very careful with this setting. Setting to very large values may actually have a detrimental effect on migration performance. Retry Count: Number of time you’d like to re-try failed items. Start Automatically: Its a good idea to set this to true, in order to ensure that the migration continues should the migration server be restarted for any reason. Reprocess Failures: Set to true if you want to retry migration of failed items. Set to false to skip over problematic items. You can always change this setting. Log File/Level: Provide a log file and a logging level, usually “Error” is recommended for production. Source Type: File System (we are rapidly developing other “source” connectors). Stay tuned. Source Root Folder: Any folder on your filesystem or remote UNC path. 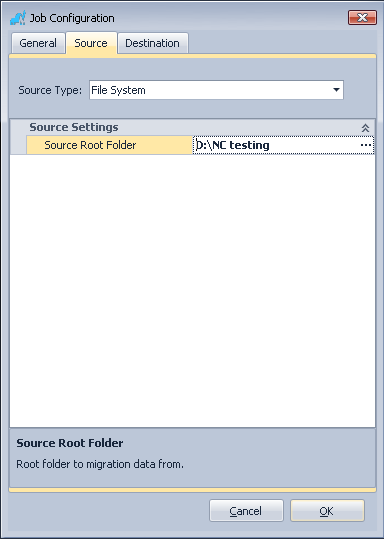 Destination Root Folder: A folder by this name will be created on the destination and the file hierarchy will be reconstructed within that folder. The “Authentication” section is optional and we recommend that you leave these settings empty. If you do so, once the task starts you will be prompted for OAuth authentication which is a more secure method that doesn’t involve storing your password on the server. You are ready to start the migration. See, it wasn’t that bad!